WHO CAN HAVE CHEMICAL PEELING DONE? You have several choices when it comes to getting Chemical Peels at Chic La Vie® in Las Vegas. The ViPeel contains a synergistic blend of powerful ingrediants suitable for all skin types. This peel provides dramatic results with virtually no pain, no skin preparations, and little down time. Why wait weeks or months for the results? Enjoy radiant, younger looking skin in about a week with the ViPeel. Vitality Institute Medical Products, beautiful skin for a lifetime. 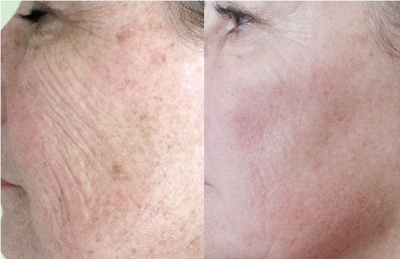 The Vipeel chemical peel will improve the tone, texture, and clarity of the skin; reducing or eliminating age spots, freckles, and hyper-pigmentation, including Melasma; soften lines and wrinkles; clears acne and skin conditions reducing or eliminating acne scars; and stimulate the production of collagen, for firmer, more useful skin. ViPeel also works well in conjunction with lasers, injectables, and post procedures. Ask about our competitively priced packages on chemical peel treatments.